When we buy a salmon fillet from Costco, I can usually spread it out for about 4 meals. I cook two-thirds of it fairly simply like that above, roasted in foil packet at 500F with some caper-anchovy butter for about 15 minutes, or just until cooked through. The inevitable leftovers from these simple recipes then go into salmon salads, croquettes, and chowders, and et cetera. But it can be pretty boring working primarily with leftover cooked salmon, so I always try to save at least a little of the fillet to try out a new technique. 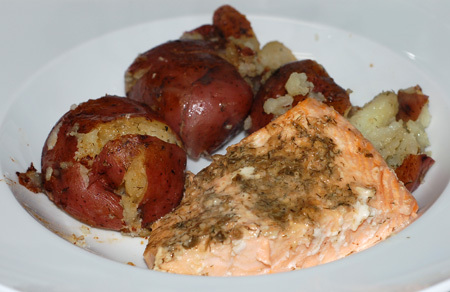 So here are two slightly more interesting salmon recipes, both incorporating herbes de provence as a flavoring agent. The first is seared salmon with a beurre rouge sauce. I’ve made beurre blanc before; this is essentially the same thing using red wine. I served mine with muffin cup gratins. Combine shallots, herbes de provence, wine and vinegar in a small saucepan and turn heat to high. Cook until it is reduced to about ¼ cup, 10 minutes or so. Strain if desired. Meanwhile, put a nonstick skillet over medium heat; no fat is needed in pan. Sprinkle salmon with salt and pepper and place it, skin side up, in skillet. Cook over medium-high heat until nicely browned, about 5 minutes, then turn. When red wine mixture has reduced, turn heat to very low. Add butter a piece at a time, stirring after each addition until it is incorporated. When all butter has been added, taste and adjust seasoning. Use a sharp knife to peek inside thickest part of fish to judge doneness. When done to your liking, about 3 to 5 minutes after you turn, remove it to a platter or serving plates. Spoon sauce over fish, garnish if you like, and serve. Source: Slightly adapted from Mark Bittman, NY Times. For the other recipe, I took inspiration from having randomly watched an episode of Diners, Drive-Ins and Dives in which a gentleman cooked salmon encrusted with hash browns. I’ve used a similar technique on halibut, which relied on a mayonnaise mixture and the starch from the potatoes to stick them onto the fish. This guy used what he called “salmon glue” to attach the potatoes, essentially a simple salmon mousse made with trimmings, seasonings, and cream. As I was trimming away the thin parts of my fish, I flashed back to this episode and decided at the spur of the moment to give it a shot, and it worked beautifully. 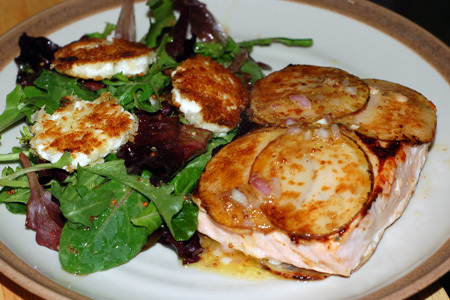 I served my crusted salmon with a grainy mustard vinaigrette and a quick salad garnished with disks of fried goat cheese. The recipe is more of a method than anything, as I don’t include amounts. I think this method would also work with halibut or other fish; possibly even chicken cutlets, though I’ve not yet confirmed this with testing. If you don’t have scraps from trimming because you used steaks or already uniform fillets, you might be able to use raw shrimp or bay scallops as the base of your glue. It would work with shredded russet potatoes, zucchini ribbons, or virtually any thin layer you want to stick onto the fish. If I try out any of these variations, I’ll make a note of it here. Place the salmon scraps in a food processor with some shallot, herbs and cream. For our two portions (plus a baby piece for Nolan), I had enough scraps to use 2-3 T cream, 1-2 T shallot, about 1/2 tsp herbes de provence, and a pinch of salt and pepper. Run the processor; you want to end up with a light, fluffy, spreadable, but not runny consistency, so add a bit more cream if necessary. Season the salmon fillets with salt, pepper and another sprinkle of your herbs, then smear on one side with about a 1/4″ of your glue; layer with potato slices, making sure each one has some contact with the glue. Flip fillets over carefully and repeat on the other side. Meanwhile, heat some olive oil in a non-stick skillet over medium heat. Carefully lower in the salmon, ensuring that the potatoes stay in place, and cook for about 5-7 minutes, until the potatoes are golden brown. Flip gently and cook on the other side until the potatoes are again golden and the salmon is cooked through to your liking; if you, like us, don’t care for medium salmon, you may need to turn the heat down at the end and lid the pan for a few minutes to finish cooking through. Serve with the sides and/or sauces of your choice. It is mouth-watering just reading your post. Thank you for sharing these two recipe. I was wondering what kind of salmon you normally buy at Costco? Do you happen to know if it is farmed salmon or wild salmon? I have read that wild salmon has higher Omega-3 content and astaxanthin in it. I live in a remote area in Arizona so unfortunately I don’t have ready access to Sam’s and it’s not always easy to find good salmon so I order it online. 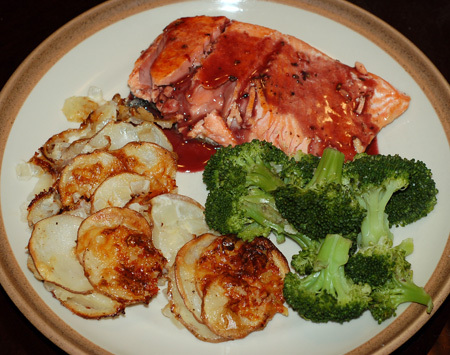 Interestingly, I read at http://www.order-salmon.com that Sockeye salmon is one of the best kinds of salmon you can eat because of its higher Omega-3 content. Another good reason I guess, why salmon has become so incredibly popular. Kendall, we get the wild salmon over farmed whenever it is available, and also prefer Pacific to Atlantic salmon. Sockeye is definitely one of the best. We’re lucky to be in Oregon and have so much access to good salmon. Wish we could visit my brother-in-law more often… he lives in Alaska and catches it himself! Thanks Julie. You’ve me made a convert to Sockeye salmon. And thanks Kendall for the link where I learned about the health benefits of wild caught salmon. Glad to hear it, Cathy! Right now is the perfect time of year to look for it too. We just had Copper River sockeye here a few weeks ago, mmm! I went to the website recommended by Kendall and discovered a lot I didn’t know about salmon. I read and watched videos at http://www.order-salmon.com/salmon-global-warming-salmon-climate-change.php Now I’m worried about salmon. I’m worried that the loss of salmon will drive up the price of fish oil and Omega 3. I’m worried about where we are going to get Omega 3. It says that the oceans are becoming more acidic and that this endangers the food that salmon feed on. What do you know about this? What can we do about it? Anything? Any ideas Julie?